'Tis that time of year again in Austin when my Facebook feed gets flooded with photos of adorable children frolicking in fields of native Texas bluebonnets. This year I bent to the pressure and took Iyla to the Lady Bird Johnson Wildflower Center for her own little photo shoot. The results are pretty cute if I do say so myself, and we had a blast exploring all of the fun activities the Wildflower Center has to offer. 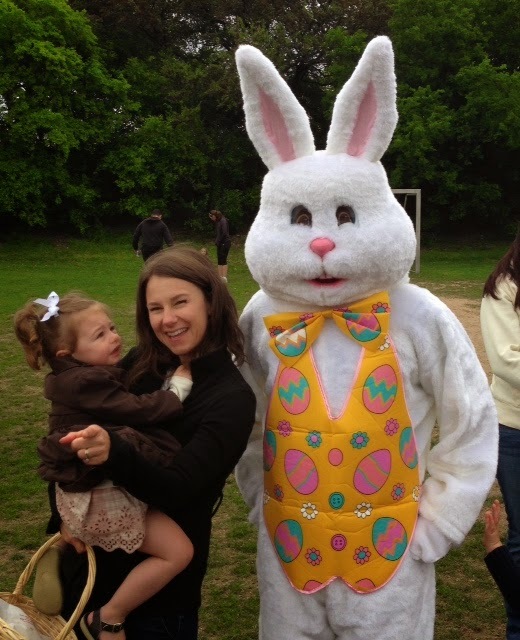 You may remember the Infamous Easter of 2013? Well, 2015 ended up being quite a doozy as well. 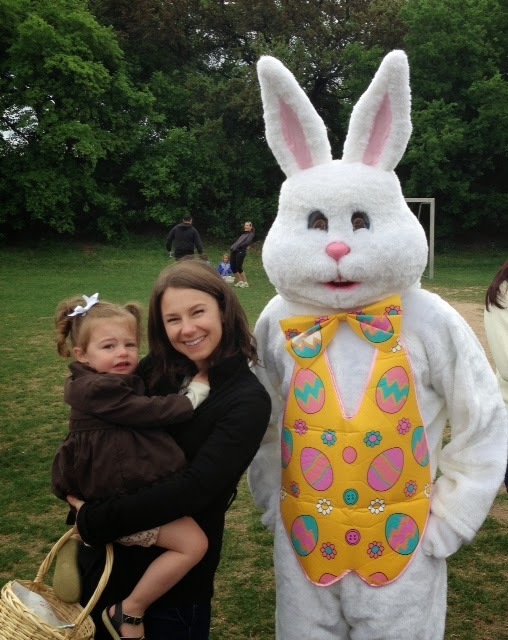 She loved watching the Easter Bunny from afar, but wasn't too hip to get up and personal with him. I fully blame infertility for this Easter spoiling, as I had just come off an unsuccessful IVF cycle and only have one kiddo to properly dote on. Plus- that play house was a mere $11 at a local resale store! We hosted an Easter celebration with my family the weekend after Easter proper. Iyla was super excited to wear her fancy dress (she's a girly-girl through and through! ), and promptly went to work devouring many "Mimi crackers" from my mom. We all couldn't get enough of sweet baby Sam! Seeing Iyla with her admittedly made my Mama heart ache; I so hope that someday she gets to have her own baby sibling to adore. Dinner time! Per our norm, we catered most of the meal. I am not super adept in the kitchen, as evidenced by my burning the dinner rolls while trying to heat them up (I ended up cutting off the burnt bottoms of every.single.roll). We had a lovely day with everyone. Come evening, Iyla was happily singing and dancing when I noticed it was past her bedtime. She gave goodnight hugs to the family and we headed upstairs to start her bedtime routine. I set her down at the top of the stairs and let her know it was time to sit on the potty. Instead, she made a beeline for her room- saying she wanted to go 'ni-night' first. She was one tired little girl! I followed Iyla into her room to grab her pajamas, then watched as she ran toward her bed, tripped, and fell face first into her bed's wooden toddler rail. I knew instantly it was bad. Every hair on my body stood alert as my heart dropped to my stomach. In the few seconds between Iyla's shock and her subsequent wails I scooped her into my arms to comfort her and assess the damage. I immediately noticed a large gash on her chin, and yelled down the stairs for someone to please send BC up quickly. When he arrived he took one look at her and said we needed to head to the ER. Our poor baby girl was SO tired and confused and just wanted to go to bed. Instead, I had to carefully change her out of her blood-soaked Easter dress and into comfy pajamas toward the long night ahead. I told her we were going to have a silly night, and that she would get to watch lots of her beloved videos on the iPad. We got to the ER at 8:30pm, and would remain there until 12:30am. It was a long night to say the least, filled with waiting room after waiting room. The worst part was having to restrain Iyla while they gave her sedative medicine up her nose. Gratefully it worked quickly, and 10 minutes later she was in a very chill, loopy zone. BC and I were amazed at how calm & compliant she was- looking around the room at all of the assembled staff, then turning to watch her iPad while the doctor administered 5 stitches. The next morning I asked Iyla if she remembered going to the hospital for her boo-boo. She surprised me by replying "yes- it was so beautiful." Indeed, she did love the fancy colored exterior lights at Dell Children's Hospital, and I just love that this was her overall recollection of the night. The irony of it all? We had just converted Iyla's crib to a toddler bed so she wouldn't climb and fall out of bed. Then that little bugger goes and falls INTO bed, splitting open her chin. Go figure! I am happy to report that Iyla has completely bounced back from her injury (save for some sleep deprivation), and life has resumed as normal. She is one tough little girl! "I have 5 stitches. Whatchu got?" I'm thinking that next year we'll ask my Aunt Sheri to host Easter. We are 2 for 3 in Infamous Easter debacles, and it may be time to shake things up- lest this become an annual tradition! It's official: we moved Iyla into a big girl bed last night, after a week of pretty intense sleep regression. I must admit I thought we'd get a lot more time out of her crib. This is a kid who has always gone down easily for naps & bedtime (save our big sleep regression in February), quietly & happily playing until she falls asleep. She'd consistently take two hour naps and sleep through the night from 8pm-7:15am. Iyla suddenly started protesting nap & bedtime, hysterically pleading for me to stay in the room with her or take her into my bed. Once put in her crib she would become frantic, screaming & thrashing all around. She'd wake 3-4x/night crying and needing much soothing. We did take her into our bed on several occasions, as that seemed to be the only thing that truly soothed her. There have been no big changes in our schedule or lives to precipitate this shift. No new teeth to blame it on. The best I could come up with was that Iyla was going through another major perceptual leap; that something in her world had changed to the point where she was now acutely aware of waking up ALONE in her room, and was needing extra comfort and reassurance. I also wondered if she was experiencing nightmares, as sometimes she awoke drenched in sweat. I was torn. Should I continue to go into her room to comfort her each time she woke, bringing her into our bed as needed? Or keep loving & firm limits about staying in her own room- letting her know she was safe and loved, but being careful not to start new bedtime habits we didn't want to continue? Then Iyla made the decision for us. On Friday BC was on night duty so I could get some much needed rest. He reported that during one of Iyla's middle of the night meltdowns she started climbing out of the crib (a first! ), so he brought her into bed with him. There was really no choice in the matter. We needed to convert her crib into a toddler bed immediately, lest she have a middle of the night fall while trying to climb out. And so it was that we very quickly (& unexpectedly!) had to toddler-proof Iyla's room. The crib was converted, all outlets covered, lamps removed, & cozy book stations created. I made a big deal to her about having a BIG GIRL BED, and let her know that if she awoke sad in the night she could now get herself some books to read until she feel asleep again. We gave the new bed its first go at nap time yesterday. Iyla wanted me to stay in the room and sit in her chair while she went to sleep, which I did. She didn't take a long nap (about 45 minutes), but it was better than the complete lack of nap the day prior! At bedtime we started an entirely new routine. I thought this big girl transition would be the perfect opportunity to finally kick the bottles (yes, STILL BOTTLES OVER HERE). The new routine consisted of milk in a cup downstairs while playing, then heading straight to the potty upstairs. After the potty I had Iyla chose a few books to snuggle and read together. She actually told ME halfway through the 3rd book it was bedtime, and went and got herself into bed! She didn't seem to miss her bottles at all. Another big change we had to make was to start closing Iyla's door. With her last sleep regression we started leaving it open, as this gave her a lot of needed comfort. Now? Way too risky with a toddler on the loose and our staircase being located directly outside her door. I told her that we had to keep the door closed so Sam (our cat) wouldn't get into her big girl bed at night. She bought it and didn't make any fuss when I left the room! *She quickly popped up, ran across her room, and then ran back into bed. *She got up again and went offscreen; I could hear her rustling through her books and then knocking on her door. Then that little bugger quickly figured out how to OPEN THE DOOR (which she's never done before). We'll have to figure out something more permanent soon, but it did the trick! BC had night duty again last night and reported that Iyla did not cry out once. That is HUGE after a week's worth of nighttime frantics! However, when Iyla started pulling on her door to come out around 6:45 this morning, she was very evidently sleep deprived. Super fussy, tired, and inconsolable. I am guessing that with all of the excitement of her new room and freedom that little lady didn't get much sleep at all. The lack of nighttime crying tells me that we are on the right track… now I just hope that our sweet girl starts getting the rest she (and we!) genuinely needs. Our little Iyla Grace is growing up!